Nasty weather can sometimes keep kids stuck inside. Being cooped up inside can be frustrating for kids and parents. Often children spend more time using screens like TV and tablets than they normally would because of their limited play options. When kids say they are bored, there are so many different games and activities children can try instead of using screens. 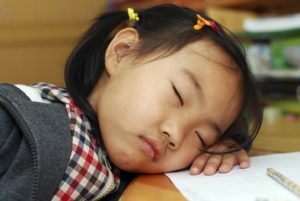 Next time your child is stuck inside on a rainy day; offer some of these suggestions when they tell you they’re bored. Boredom Jar: One creative mom told us that she made “boredom” jar for her house. She cut scraps of paper and wrote down different activities, crafts, games, and even chores on the pieces of paper. Whenever her kids say they’re bored instead of watching tv, she lets them choose three papers from the boredom jar and they can choose an activity to complete. Any of the activities below would be a great to add to your jar. Build a Fort: Let your child gather blankets, pillows, cardboard boxes, and chairs. Use them to make a pillow fort they can climb inside. Bring a flashlight and some stuffed animals and make it a party! Indoor Obstacle Course: Obstacle courses can be a fun activity both outdoors and indoors! Kids might need help setting them up depending on their age. Obstacle courses are a great way to keep kids moving on days they can’t play outside. Try moving over and under things, rolling around, hopping on one foot or both. These moves help your child practice essential motor milestones. Be sure to let your child think of changes to make to the course as well to get their imagination going. Have a race and get involved. Remember to be safe and make sure sharp corners and breakable objects are put away or kept in a safe place. Write a letter: Did you know that handwriting, coloring, and cutting are a great way for children to practice fine motor skills? Get out fun stationary or plain paper and envelopes and let your children decorate the paper. Help them write a letter to a distant relative or old friend. If they’re too young to write, have them make a card with illustrations. Teach them how to address the letter and explain the how postage and stamps work. Sock Puppets: Do you have any lonely, single socks lying around that just can’t seem to find a partner? Have some fun making them into sock puppets with your child. Use markers to draw faces and scissor to cut a mouth. Put on a puppet show! Dress Up: Start a costume bin in your house. Fill it with your clothes from past decades, old Halloween costumes, and goofy finds from thrift stores. 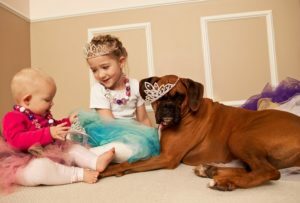 Whenever your little one is looking for something fun to do, pull out the costume bin and let them step into character! Imaginary Creatures: Let your child invent an imaginary pet. It can be a pet they wish they had or it doesn’t even have to be a real animal. Sometimes the mythical, made-up animals are more fun. Does it have the body of an eagle and the tusks of an elephant? Can it fly? Can it swim, but only in pools? Have your child come up with a name and a story of origin for their creature. Your child can draw pictures to tell the story of how their creature came to be. Tea party: Let your child don their fancy clothes and gather all their stuffed animal buddies. Perhaps you can play the butler and serve “tea” as your child leads conversations with his/her friends. We tend to think of communication milestones and language development when our children are learning their first words, but language development doesn’t end there. Did you know your child is learning to hold conversations and communicate socially when they play? Close your Eyes and Guess Game: Just like the name suggests, you take turns closing your eyes for this game. Brush a mystery object on your child’s hand and let them describe how the object feels and then guess what it might be. Try a feather, piece of fruit, or book. This game makes children use their sense of touch in place of vision relying on sensory integration skills to do so. There are countless other options for rainy day activities you can add to your family’s boredom jar. These can be activities for the entire family or open ended activities for your child to complete on his or her own. Can you tell if your child is overloaded with activities? USe these tips to help balance extracirriculars. 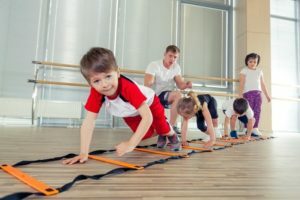 Get your kids moving with 13 different ways to move like animals! These are great ways to practice gross motor skills.